Most 1965-72 A-bodies (Skylark, Cutlass, Chevelle, LeMans and 1970-2 Monte Carlo & Grand Prix) came with drum brakes and are not very desirable. 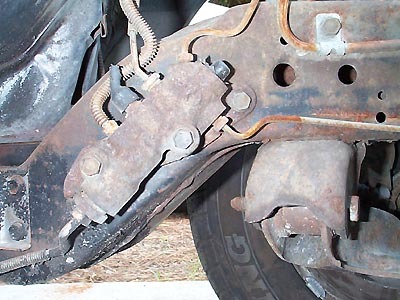 Drum brakes do not work as well as disc brakes and were phased out by GM beginning in 1973. In that year, all A-body cars came with disc brakes standard. Unfortunately, the 1973-77 A-body disc brake set-ups will not work on the 1965-72 cars. So, you will need to find a 1965-72 A-body with disc brakes. They are usually found on higher end models such as GS, 442, GTO, SS and some 4 doors and wagons. Most of the time the cars that you can find in salvage yards with disc brakes will be 4 dr hardtops and wagons. Most of these models have disc brakes. Also, all 1970-2 Monte Carlo and Grand Prix models have disc brakes as standard equipment. As an option, you can use the 1972-81 F-body (Camaro, Trans AM, Firebird) front disc brakes on the 1965-72 A-body cars with an adapter kit available from Hotchkis Performance. The kit runs about $390 and can be purchased from JEGS at 1-800-345-4545, kit #515-1103. The most important part to get is the spindle with backing plate. Also, make sure to get the proportioning valve which is located on the frame rail directly below the master cylinder. They are not available as rebuilts or at auto parts stores. All other disc brake parts are available as rebuilt or new: brake hoses, brake calipers, rotors, pads, master cylinder. New banjo bolts are available from NAPA #82701 for $5 each. See the pictures below for more help. 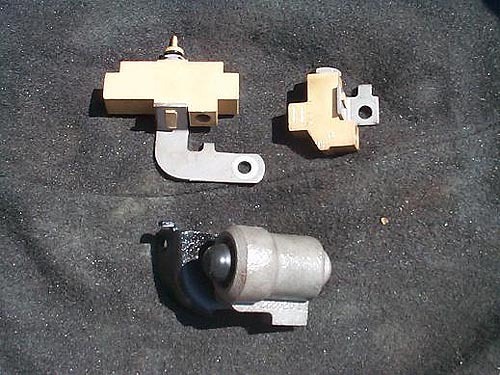 The lower unit with Bendix cast on it is a disc brake proportioning valve. You can see how different it is from the drum brake version located directly above. Some 1971-2 A-bodies may have the lower unit even though the car has drum brakes. You can use the 1973-77 prop. valves since they are the same and are quite plentiful. Here is the disc brake prop. valve installed in a 1972 GS455. This one is a Delco Morraine unit as indicatd by the small circle cast on the surface. Note: If you are installing headers, the 1971-2 valve may contact #7 exhaust tube. I have encountered this problem on Poston headers and M/T Super Scavenger headers. The only way to solve this problem is to either dent the header tube for clearance or relocate the valve. I remove the mounting bracket and mount the valve directly to the frame rail (GM did this with all 73-77 A-body models.) You may also have to lengthen the brake lines depending on your mounting location. Test fit before installing headers! 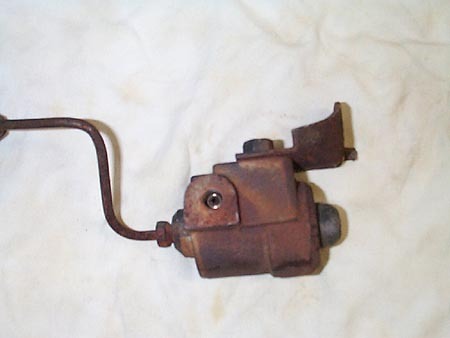 Above is the 68-70 disc brake hold-off valve that is attached directly to the master cylinder and it regulates fluid flow from the front reservoir to the distribution valve located on the frame rail. The hold-off valve delays the disc brakes from activating until the drum brakes work first. 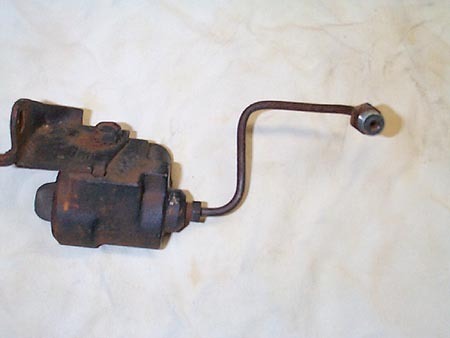 This item disappeared in 1971 with the design of the new prop valve by Bendix as pictured previously. Here is the complete original set-up from a 70 GS455 with disc brakes. No company reproduces the correct hold-off valve(lower item) or the rear delay valve (top right). 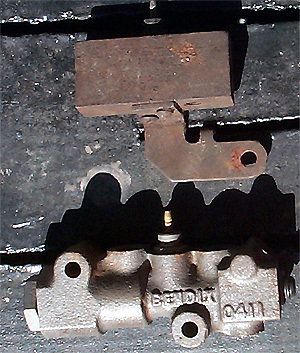 If you are doing a concours restoration, you will have to find these valves from a salvage car. 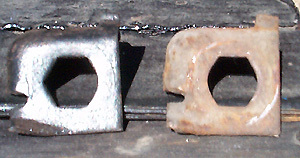 Here are the brake hose brackets which are mounted on the frame rail just behind the upper A-arm. The one on the left is for disc brakes. Notice that it has 5 interior corners while the drum brake version on the right has 4. You can make your drum brake versions into disc brake ones by using a file. It only takes a few seconds to remove the brake hose brackets which are held to the frame rail with a 1/2" hex head screw. This part is the one most forgotten at the salvage yards. NO FLUID FLOW TO EITHER FRONT OR REAR BRAKES. LIMITED FLUID FLOW TO EITHER FRONT OR REAR BRAKES. BRAKE WARNING LIGHT STAYS ON. BRAKE WARNING LIGHT COMES ON INTERMITANTLY. Connect A Test Light From The Positive Terminal Of The Battery To The Warning Light Wire Lead. Slowly Depress The Pedal, Hold And Close Both Bleeders. Repeat 4-5 Times Until The Test Light Shuts Off. Resume Normal Bleeding Until Air Is Completely Removed.